This taste of autumn-like weather hangs on (although we're still 2 weeks away from the start) as we'll stay in the lower to middle 60's across the Upper Cumberland region today. There is a 50% chance for showers and it'll mainly be for the morning hours. Rain chances decrease for tonight through the weekend with increasing temperatures each day. 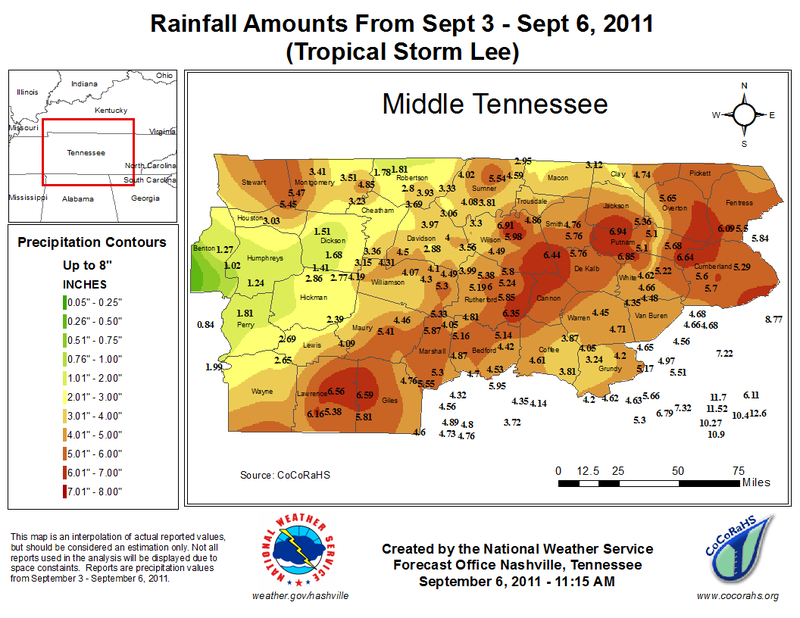 Totals from what was left of Tropical Storm Lee racked up some impressive totals right here in Putnam County. It seems the northwest section of our city/county had the most with nearly 7" recorded. Up in Monterey, they had almost 6 and 1/4 inches and in the downtown Cookeville area, nearly 6" was recorded at various sources. The highest total in Tennessee belongs to the Cleveland/Chattanooga areas with between 12" all the way up to 13.42" at a station just 3 miles to the ESE of Cleveland, TN in Bradley County. Tuesday's high of 59.9° was the coolest high temperature since a high of 58° way back on May 18th, a span of 108 days! Speaking of 59.9° degree high, did you know our typical high for September 6th is 85° and we were 25° above normal. To put that in perspective, if we were 25° ABOVE normal, the high would have been 110°. 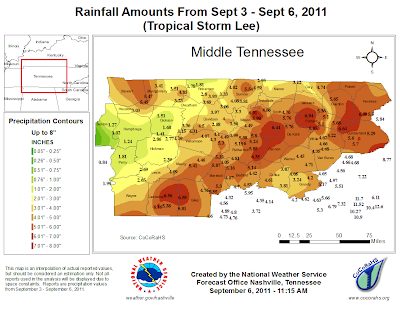 Tuesday's rain's were a record in Cookeville and I expect this morning's observation will produce another record. September monthly precip total: 5.90"
2011 annual precip total: 54.19"
I did not mention this in the morning post, but we are watching an area of development in the Gulf that looks quite favorable for tropical development over the next 24 hours.